Do you remember the story of how Diogenes the Cynic, upon hearing Plato equate man to a featherless biped, extended a plucked chicken and said, “Here is Plato’s man”? Though Diogenes could hardly have foreseen it at the time, his featherless, clucking fowl might just as easily have doubled for one of the shambling infected in what’s supposedly the very best PG-13 zombie movie possible, World War Z. Hollywood has offered us images of zombies fast and slow, diminutive and enormous, viral and grave-risen, terrifying and comical, undead and perfectly healthy (after all, how else do Will Ferrell and Adam Sandler continue making movies without zombie America to pay for them? ), but none quite like the bird-calling, teeth-gnashing, head-bobbing villains of this summer blockbuster fare. Bok. Bok. Bok. As generic protagonist Gerry Lane, a grizzled and unkempt Brad Pitt (really, what happened to this dude?) does take several swings with the crowbar throughout this movie, but most of the time he’s too busy fleeing from the undead swarms to make much of a stand against them. World War Z opens with a montage of thematically unrelated stock footage and sound bites of influential CNN commentators wondering aloud whether the apocalypse is finally upon us. While the idea of Piers Morgan telling viewers to disband the 2nd Amendment and relinquish their bloody guns in the middle of a zombified world war would be quite witty as comedy material, writer-in-part Damon Lindelof of Prometheus, Star Trek Into Darkness, Cowboys and Aliens, and several other projects that generally aren’t well regarded opted instead to write a self-serious, globe-trotting battle for the fate of humanity, a battle that doesn’t even have a clear resolution for its 2-hour running time. Despite all of Lane’s efforts to stem the spread of the virus, the monumental discovery he eventually makes “has only bought us some time” by the very end, giving the studio an excuse to implement World War Zz in the event that the box office vouched to its feasibility (unfortunately, it did). Regardless of his movie’s sequel potential, Lane lives with a wife who calls him at inconvenient, stealth-requisite times and two daughters, one of whom suffers from asthma attacks and the other of whom likes pancakes. That just about sums up all the humanization you can expect from this adaptation of a Max Brooks history which focused not on any single scruffy-bearded superhero but vividly recounted the horrors of the zombie war through interviews with many survivors of entirely different nationalities and cultures. One thing that I Am Legend did moderately succeed at was making me at least care for the survival of Will Smith and his constant canine companion; the most powerful scene in that movie was shared between those two characters in a dark room after a devastating strike by mutated hounds. Smith has wrapped his German shepherd in a tight bear hug, desperate to relish their final moments together on this earth, when the weak and lifeless dog abruptly snaps up with a bone-chilling snarl and lunges at his throat. Smith tightens his embrace around the deceased animal’s neck and grimaces at the work he is forced to do. World War Z has no such scene where the audience is riveted to the protagonist’s suffering, and the writers indeed render both his daughters so shallow and annoying that I was almost hoping for some juvenile zombies to spring up and join the fray. What little the film possesses in the way of a plot serves only as a means to propel the characters from one geographical hot spot to another, each with its own video game-appropriate obstacles, terrain, and new enemy types. The first level takes place in a Philadelphia traffic jam, where the zombies apparently have the special ability to drive cars and create colossal wrecks. Run for your lives, citizens, and don’t trust anyone else running alongside you, as they could just as easily be infected as clean. You’re all wearing the same clothes and look identical in the motion of a huge crowd, so just keep running. Your next destination will be some desolate South Korean airbase, where you shall attempt to acquire coveted information on the virus under cover of the night, heavy fog, and rainfall. All those factors will cover the zombies, anyway, but fear not and confront the darkness with courage. Too bad you didn’t check into the North, as Kim Jong-Un is reputed to be weathering out the apocalypse just fine with massive arms stores. Yeah, right. If you’re fortunate enough to leave this metal graveyard with your brain intact, you’ll next pay a visit to Jerusalem, which has recently enacted the world’s second harshest immigration laws by enclosing itself entirely with walls impenetrable to all but the most resourceful of zombies – specifically those intelligent and agile enough to crawl on top of each other’s shoulders in order to scale their common challenges. 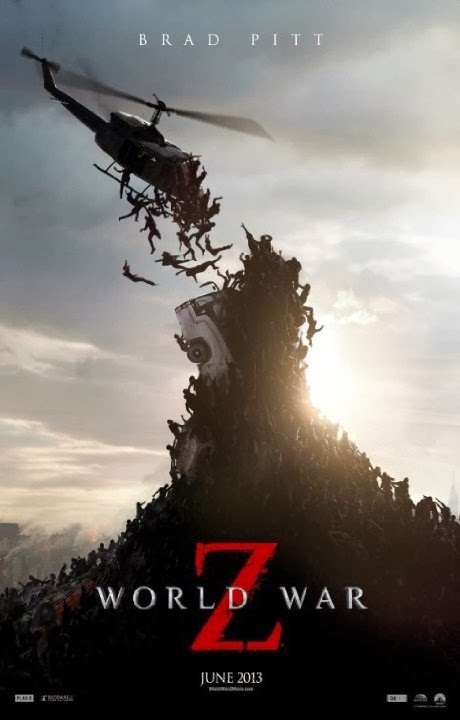 All of the somewhat cool, video game zombies described thus far should be familiar to anyone who’s seen ads for World War Z, and that’s the main problem with the feature: the mass disparity between the action displayed in the marketing and the action that largely composes the movie’s run time. The movie’s trailers wisely showcased all the over-the-top CG sequences that the film had to offer while withholding all the parts that weren’t so well executed. For a movie that had a reported budget of $190 million or thereabouts to grind, World War Z looks markedly lazier than a typical episode of AMC’s The Walking Dead. There’s no evidence that anyone put genuine thought or effort behind the monster makeup other than to pop a few veins out slightly and make the infected’s teeth look more jagged and yellow. Even those details are hard to distinguish because of the constant shaky camera and dim lighting. All these flaws compound each other in the middle of a chase scene to prevent the viewer from even separating the infected and the survivors, as they’re all running about frantically and screaming and generally falling over their own legs. The zombies are supposed to move faster than the humans, but I can’t even proffer that as a clear dividing line between the good guys and bad guys, as the latter will often conveniently slow down in the hallways of the World Health Organization and wherever else the action hero needs to elude their jaws. At the end of the world, the most horrifying zombies that Brad Pitt will ever have to face are his own writers and directors. There’s a shot during his closing monologue that depicts the forces of humanity roasting a tower of zombies with giant flamethrowers from atop an industrial skyscraper, just as Ripley torched the alien queen’s nest, except that she hadn’t been killing things which were once human. They should have roasting World War Z instead.